You can connect two devices at once, to quickly switch between a media player and phone calls or share your audio signal with other headphones for shared experiences. They are digital assistant ready, so you can use the built-in microphone to access Alexa, Siri, or Google, and have a 16 hour battery life. With the included travel case and airplane adapter, these headphones are a great way to enjoy your favorite media while you travel. The Bluetooth workout headphones from Villain are designed specifically for high-intensity activity, including sports and hard workouts. The silicone over-ear hooks stay comfortably and securely in place throughout your whole range of movement. They have a waterproof rating of IPX7, so they are rain-proof, sweat-proof, and splash-proof, and can be used in the rain or during aquatic activities. They have loud, clear sound and powerful bass to keep you moving and motivated. On-ear controls allow you to manage your device or take calls without reaching for your phone, so you can work uninterrupted, and noise suppression technology makes calls clear in loud environments. These are fantastic headphones for staying on task and motivated, no matter what your workout may be. Many people who get noise-cancelling headphones end up disappointed, feeling like they didn’t get the experience they were promised. However, much of this disappointment could be avoided with a better understanding of what noise-cancelling headphones are and are not, so that you can make the best choice for your needs. ​Many people think that once they put the headphones on, they shouldn't hear anything in the surrounding environment at all. Active noise-cancelling technologies not only do not exclude all external sound, they also don't prevent people around you from hearing sound “leaking” from your headphones. In other words, active noise-cancelling technologies do not seal you in a private audio environment. To the extent that a pair of headphones prevents audio leakage, and excludes simply all environment noise, it's due to the physical construction and materials of the headphones (called “passive noise cancellation”), not to the active noise-cancelling technologies. Active noise cancellation technology uses a microphone to “listen” to the surrounding environment. Then it generates a sound through the headphone speakers at a frequency pitched to a wavelength that “cancels out” the audio wavelength of the environment noise. In this way, background noise becomes less noticeable and distracting, and competes less with the audio you are listening to. Active noise cancelling works best with steady, low-frequency noises like motor and engine noises, so it's great for travel and commuting, or reducing the sound of traffic or air conditioning units. It doesn't work as well with high-frequencies, and works very poorly with mid-range sounds. It also doesn't work well with intermittent noises. In other words, active noise-cancellation technologies don't work well to isolate you from nearby conversations or crying babies, intermittent construction sounds, or sudden beeps and alarms. In low-quality headphones, active noise-cancelling technologies produce a sound that is not so loud or noticeable that the headphones themselves interfere with your chosen audio. Sometimes poor active noise cancellation can be intermittent, or have a lag time that is itself distracting. If you want headphones that provide as much isolation as possible, excluding external sounds as well as preventing any of your own audio “leaking,” here is what to look for. 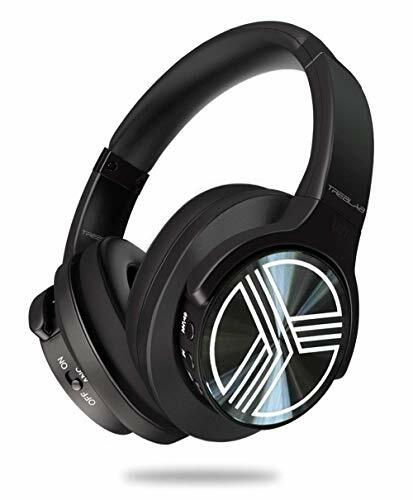 Active noise cancellation are great for counteracting constant, low-frequency sounds, so they are ideal to keep out the sounds of plane engines, dishwashers, and other motor noises. “Closed-back” headphones are designed to seal around the back of the ear, excluding external sounds, and also helping to prevent your own audio leaking out. Circumaural or “over-ear” headphones are made to completely surround the ear and rest against the head, to help to seal out unwanted sounds. “On-ear” headphones sit on the ear itself, and provide a less effective seal. On-ear headphones have a smaller size and are more portable, but they aren't as good at providing an isolated audio environment. Ear cup construction material. The most effective way to block sound waves is with mass, so density is important. Most ear cups are made from foam, but the denser the foam is, the more effective a sound barrier it creates. It's important to find a foam that is soft enough to be comfortable, but thick enough to block sound. Unfortunately, most manufacturers don't specify the density of the material in their ear cups, so many times consumers have to estimate by feeling the ear cup material and testing for thickness and density. Keep in mind that features like dense foam and big cups can also add weight to headphones, which can reduce their comfort when worn for long periods. Manufactures are constantly trying to minimize weight, but that can also minimize sound isolation. Active noise cancellation requires an ongoing source of electric power to operate the microphone and speakers. In many active noise cancellation headphones, this means that active noise cancellation only works when you are connected wirelessly and using battery power, and not when you are using the headphones with wires for power. In some active noise-cancelling headphones, this also means that the entire microphone itself will only work in wireless mode, and you can't take or make calls in wired mode. Other active noise-cancelling headphones require a battery specifically to power noise cancellation, not the headphones themselves. Many active noise-cancellation headphones have their microphone on the outside of the ear cup, which is optimal placement for monitoring distracting environmental noises and eliminating them inside the headphones. However, that isn't optimal placement for using that same microphone to make and receive phone calls, since the microphone is on the earcup pointed outward. In some active noise-cancelling headphones, this microphone placement is more awkward than in others. With our current technologies, a good compromise is an on-cable microphone, which keeps it positioned well for both speaking on calls and for listening for noise cancellation. One of the nice things about noise-isolating headphones is that you can use them wirelessly, to concentrate on work, stay motivated during a workout, or keep you company during household chores and tasks. When using wireless or Bluetooth headphones, it is incredibly helpful to have simple audio controls built onto the headphones themselves. That way you don't have to find your phone or use your device to skip tracks, adjust audio volume, take a call, or other simple adjustments. But it's not just about having on-ear controls; the buttons need to be easy to find, use, and remember with minimal distractions. In some low-quality headphones, pushing unintended buttons on the headphones can create static, cause a Bluetooth signal drop, or just take some annoying fiddling. On-ear controls can also be placed awkwardly if, for example, you fall asleep on a plane and your buttons land on the headrest. In those instances, on-cable controls may be a better alternative. Detachable cables are an important feature, not just in noise-cancelling headphones, but in any headphones. As we all know, ear pad covers and cables are the weak point of any pair of headphones, likely to wear out, break, or stop working before any other part. The ability to quickly and easily replace old cables and worn ear pad covers increases the useful life of a pair of headphones exponentially, and is a great feature to have. Following these tips will help you choose noise-cancelling headphones that do everything people are looking for in noise isolating headphones: reduce constant external sounds, reduce intermittent external sounds, and reduce sound leakage from the headphones into the world around you. With the right headphones, you can properly shut out the world around you and enjoy your own audio in peace and quiet. The Paww WaveSound 3 Bluetooth Headphones have active noise cancelling to block out annoying noises in the surrounding environment, making them great for airplane travel. The have clear high notes and deep bass for immersive sound, and extremely low latency of only 34 milliseconds for ultimate enjoyment of movies. Bluetooth 5.0 connectivity allows for faster data transfer and longer range of up to 800 feet. You can connect two devices simultaneously to enjoy media on one device but still take calls on another, or share your media with other Bluetooth headphones for shared experiences. On-ear controls have multiple functions, including volume, track selection, and Bluetooth multifunction settings. They last up to 16 hours on a single charge, and the built-in microphone not only lets you seamlessly take calls, but use your digital assistant seamlessly for hands-free operation. They fold up for easy travel and transport, and come with an airplane adapter, a zippered travel case, and a micro-USB charging cable. 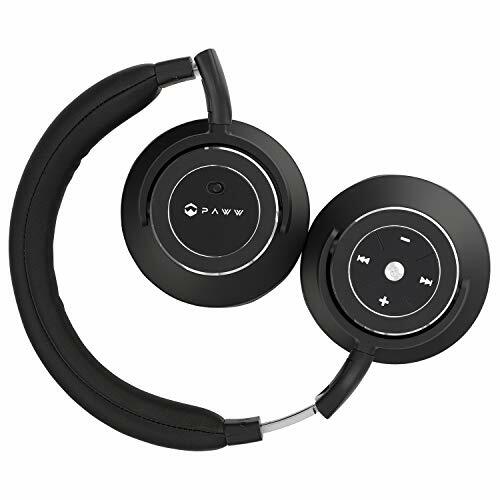 The Paww WaveSound 3 Bluetooth headphones are optimized for airline travel, with active noise cancellation, portable and foldable size, and the included travel case and airline adapter. Low latency helps you fully enjoy movies, TV, and games. Bluetooth 5.0 makes pairing fast and easy, with improved speed and a longer range. The battery life is long enough for even long flights, and they have good sound quality and robust bass notes. The ability to connect multiple devices to the headphones, or share your audio with other Bluetooth headphones, is a nice feature that adds sharing and versatility to these headphones. The Active Noise-cancelling Headphones Hiearcool L2 Bluetooth headphones have industry-leading active noise cancelling for a quiet, private listening experience, quieting background noise with just the flip of a switch. Noise cancelling can be used in both wired and wireless modes on these headphones. They have a rich, pronounced bass with clear, balanced high and mid tones. Distortion is minimal, even at high volumes. The 40mm driver has neodymium magnets for increased sound power and accuracy. The memory-protein ear cushion provides excellent comfort and noise isolation. The headband is flexible and adjustable for a great fit. Bluetooth range of up to 33 feet gives you great freedom of movement or connect with the 3.5mm jack. You can wirelessly connect these headphones to two devices at once, to enjoy your media and take calls at the same time. It has intuitive, on-ear controls and a built-in microphone. They come with an airplane adapter and aux cable, as well as a carrying case. They also have a 30-day money-back guarantee and a 12-month warranty. The Active Noise-cancelling Headphones Hiearcool L2 Bluetooth headphones have good audio quality, wired and wireless functionality, and active noise cancelling. 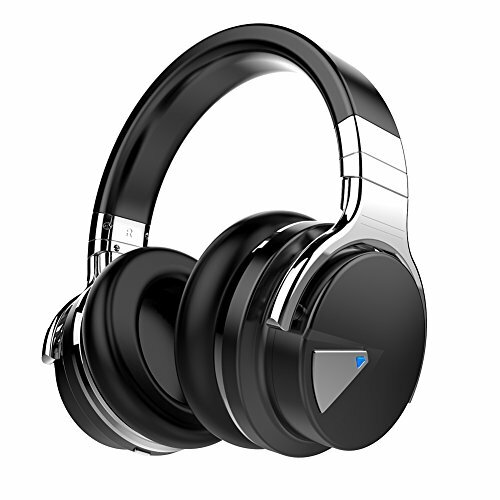 They can connect to two devices at once, have a long wireless range, and have convenient on-ear controls for fast easy use without looking at your phone, to enjoy freedom with your audio. The included airplane adapter, traveling case, and necessary cables make these headphones an easy way to enjoy your audio at home or on the go. 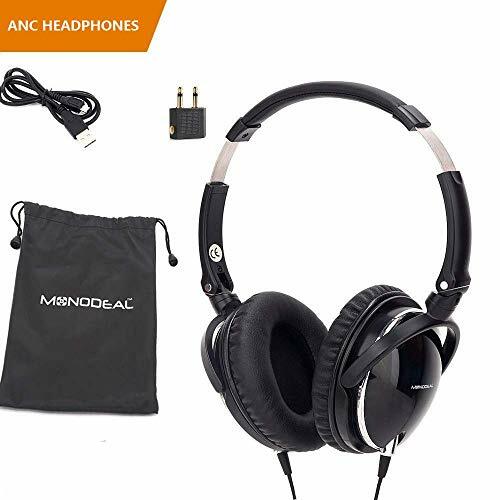 The Monodeal Active Noise-cancelling Headphones have big ear cups for improved isolation and bigger bass, and active noise cancelling to reduce background and environmental noise. The active noise-cancelling inverter reduces up to 85% of background noise, and the 40mm drivers give rich bass and powerful, balanced sound. They have a battery life of up to 20 hours. The ultra-soft memory foam ear pads provide lasting comfort. Microphone and call controls are located in the cable. These headphones fold down into a compact, portable package and stow in the included travel pouch for easy transport anywhere. The Monodeal Active Noise-cancelling Headphones have big earcups for bigger sound and improved isolation. They reduce up to 85% of unwanted noise, and have good sound and bass response. They come with everything you need to travel, including an airplane adapter, for privacy with your own audio anywhere, and fold up into a lightweight portable package. The TaoTronics Active Noise Cancelling Bluetooth Headphones have dual aperture 40mm drivers for high sound quality and more powerful bass. They have a battery life of up to 30 hours for extended use in almost any setting, and then can simply be switched and used in wired mode for longer enjoyment. They have swiveling earcups and an ergonomic headband for great fit and comfort, and soft memory foam protein ear pads for improved comfort and sound isolation. The built-in CVC 6.0 microphone makes calls clearer and higher quality, even in a noisy environment. They come with a carrying case, audio cable, and charging cable. The TaoTronics Active Noise Cancelling Bluetooth Headphones have good sound, with dual aperture drivers, and swiveling earcups and an adjustable headband for comfort. The microphone has noise-cancelling technology for clear voice calls, and the long battery life means you can use them without being tethered to a device. When the battery runs out, you can continue enjoy them as traditional wired headphones without noise cancellation. 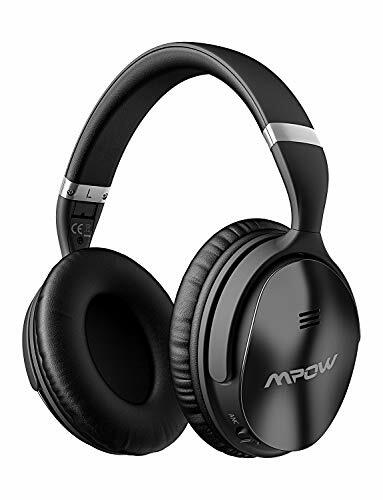 The Mpow H5 Active Noise-cancelling Headphones are lightweight, adjustable, and comfortable, for all-day wearing. They deliver deep, powerful bass. The headband and protein earpads are both comfortable and durable. They have the noise-cancelling control built into the earcup, and the earcup controls can also manage volume, tracks, and switch to take calls. They have Bluetooth 4.1 for fast pairing and a range of up to 33 feet. The battery lasts for up to 30 hours. The foldable design is compact and portable, and they come with an eco-friendly travel pouch. They also come with a 45-day money back guarantee and a 2-year warranty. The Mpow H5 Active Noise-cancelling Headphones have good sound and deep bass. On-ear controls manage active noise cancelling, as well as calls and audio playback, so you don't have to fumble for your phone in order to smoothly take calls and resume tasks. The long Bluetooth range makes these a good companion for chores and workouts, when you need freedom of movement, and they fold down into a small size and fit into their eco-friendly travel pouch for fast and easy travel or storage. The TREBLAB Z2 - Premium Sports Wireless headphones are designed for workouts and high activity. The long, 33 foot Bluetooth 4.2 range gives you great freedom of movement when exercising, and the snug fit stays put without adding weight. Active T-Quiet noise-cancelling technology reduces distractions, and the 40mm neodymium speakers give great sound quality with high performance. They are made of premium, ultra-soft materials for a custom, comfortable fit. They have a PlayXTend battery with up to 35 hours of charge, and reach a full charge in 3 hours. CVC 6.0 noise cancellation also provides clear phone calls, and you can easily switch between devices. The ear cups swivel 160 degrees, and they come with a carrying case for easy travel. They also have a 30-day money back guarantee and 1-year warranty. The TREBLAB Z2 - Premium Sports Wireless headphones have a lot of features to make tough workouts easier. Wireless Bluetooth connectivity with a long range gives you freedom for a full range of motion without managing cords or devices. Active noise cancelling reduces distractions and keeps you focused and motivated. The fit is ergonomic, lightweight, and comfortable, while being snug enough to stay in place no matter what your activity level is. They connect to two devices at the same time, and have noise cancellation in the microphone for crystal clear calls. A long battery life keeps you moving, and they even come with a carrying case for easy portability. The COWIN E7 Pro Active Noise-cancelling Headphones have professional active noise-cancelling technologies and a comfortable, over-ear design that improves sound isolation. They come in a range of stylish colors, and have a 45mm large-aperture driver for powerful, accurate bass. The ear cushions are soft and comfortable, with protein padding for comfort and a 90 degree swivel for fit and storage. The NFC pairing enables quick and stable Bluetooth connections, and a built-in microphone makes hands-free calling easy with the on-cup controls. They have a 30-hour battery life, and can be used in wired mode when the battery runs out. They have a 4-hour charge time. They come with cables, an attractive carrying case, and an 18-month warranty. The COWIN E7 Pro Active Noise-cancelling Headphones come in a wide range of colors to suit any style, and provide good noise cancellation and sound isolation. They have good sound and powerful bass, with fast, stable Bluetooth pairing and easy on-cup controls. The earcups are comfortable and swivel for fit and for easy portability, and the long battery life lets you enjoy your audio in peace and quiet for longer, worry-free. The AUSDOM ANC8 Active Noise Cancelling Bluetooth Headphones are adjustable, stretchable, and ergonomically designed for a great fit. The 40mm driver delivers Hi-Fi stereo sound. The soft protein leather pads and quality materials feel comfortable against the skin, while memory foam improves sound isolation. They have a built-in microphone for hands-free calls. CSR Bluetooth uses less power and has faster and more stable connections, with low latency. They charge in about 2 hours, and have a battery life of up to 30 hours. They fold down for easy travel and storage. They come with carrying case, cables, and a 1-year warranty. 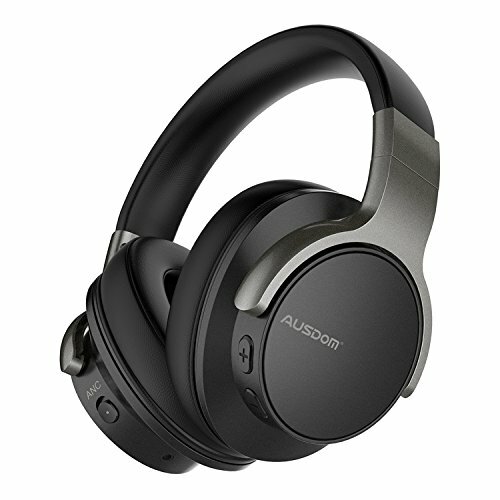 The AUSDOM ANC8 Active Noise Cancelling Bluetooth Headphones have Hi-Fi sound and a comfortable, adjustable, stretchy fit for great ergonomics and staying in place. The memory foam ear pads enhance comfort and sound isolation, and protein covers are comfortable on the skin. Advanced Bluetooth uses less power and has low latency, so you can enjoy TV, movies, and games without distracting latency, or running out of battery. They charge fairly quickly, at just 2 hours, and last for up to 30 hours. They fold down compactly for travel and storage. 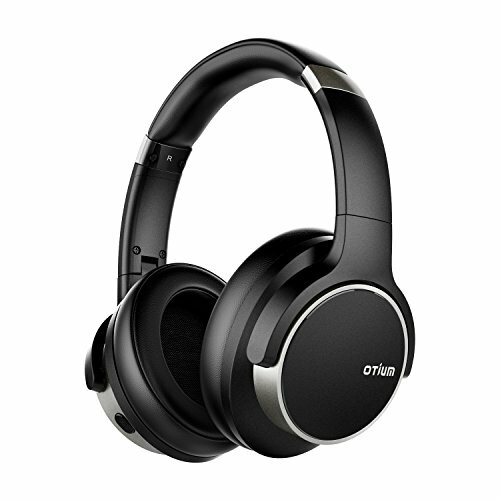 The Otium Active Noise Cancelling Bluetooth headphones offer noise cancellation in both wired and wireless modes. They have precision-engineered 40mm stereo drivers and advanced Bluetooth CSR chipset for powerful, steady audio. They are ergonomically designed with swiveling earcups, and an adjustable headband for great fit and lasting comfort. The cushioned, protein ear pads also improve noise isolation. They have up to 20 hours of battery life in ANC mode, and 25 hours in listening mode, and charge in 1-2 hours. They have a built in microphone and on-ear controls for fast adjustments. They pivot and fold into a compact size for travel or storage, and the included case is rugged and protective. They have a 30-day return policy and a 1-year warranty. The Otium Active Noise Cancelling Bluetooth headphones have powerful sound and fast Bluetooth pairing. The ergonomic design is comfortable for long wear, and the adjustable headband and swiveling earcups provide a good fit. They have on-ear controls for easy adjustments, and charge in just 1-2 hours, with up to 25 hours of battery life. They come with a rugged carrying case, and fold down into a compact size for easy travel and storage. These Active Noise-cancelling Headphones effectively block out 95% of background noise and have rich, balanced sound from premium 40mm stereo drivers. They have rich bass and detailed sound. The adjustable headband has a stainless steel bracket for durability over time, and the premium memory foam ear pads are comfortable. The light weight provides long comfort and makes these headphones easy for travel. They fold down into the included carrying case, and come with all necessary cables and an airplane adapter. It has a microphone and controls on the 3.5mm cable. These Active Noise-cancelling Headphones create rich, deep sound and block out up to 95% of background and environment noises for good isolation and privacy. They have premium memory foam ear pads to improve sound isolation, and comfortable padding for long wear without being heavy or distracting. They fold into a small size and have an included carrying case for easy travel. The included airplane adapter makes them easy to use on flight. They weigh just 5.3 ounces, for great comfort and easy portability. They also fold flat and fit into the included slim carrying case. They have detachable cables, and come with gold-plated ¼ inch and 3.5 mm cables, as well as an airline adapter. The JVC HANC250 Noise Cancelling headphone are designed to provide both active and passive noise isolation, so you can enjoy your audio in peace and quiet even with active noise cancelling turned off. 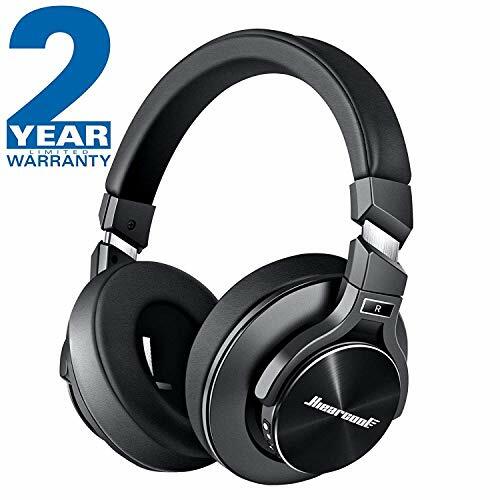 The physical sound isolation and memory foam pads also provide greater comfort, and these headphones are exceptionally light weight and compact for over-ear noise cancelling headphones. They come with all the necessary cables and adapters, and detachable cables can be replaced if they wear out. The ALWUP Stereo Gaming headset has great audio, with 50mm graphene drivers for exceptional sensitivity and frequency response. The wider soundstage creates a better sense of spatial relationships and location when gaming, to improve immersion and game play. The omnidirectional microphone picks up sound from any direction, but has a noise reduction to improve voice quality and reduce distortion. The boom arm allows you to position the microphone in the most comfortable way. The durable steel frame has a self-adjusting headband to fit heads of all sizes and shapes, and a suspension design to reduce weight and prolong comfort. The earcups have memory foam cushioning and soft, breathable bionic protein covers for extended wear. It has a great design, with LED lights that create a unique gaming atmosphere. This headset is also glasses-friendly and won't crush ear pieces into your head. It is compatible with PS4, PS4 Pro, Xbox One, PC, laptops, tablets, iPads, Nintendo Switch, and smartphones. It has on-cable controls for volume and muting, and an extra-long cable for positioning any way you prefer. It comes with all the necessary cables, connectors, and adapters. 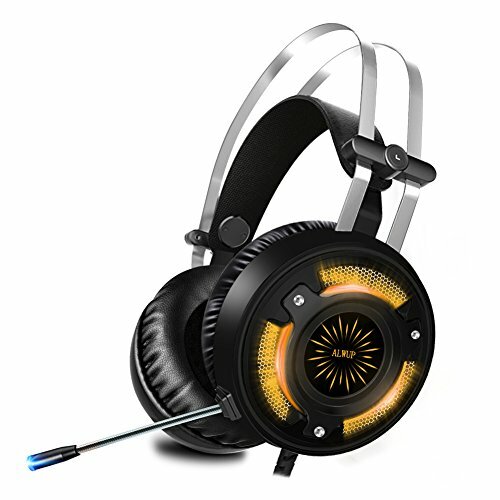 The ALWUP Stereo Gaming headset have good sound and create a big sound stage, for accuracy in listening that improves game play by allowing you to correctly identify the location and source of in-game sounds. The microphone boom arm can be positioned comfortably at any height, instead of just two, and has an omnidirectional pickup and noise-cancelling features so your conversations are clear and free of background noise. The suspension design is lightweight and comfortable, and don't add over-ear pressure for people who wear glasses. The LED lights add a cool visual effect, and on-cable controls make it fast and easy to operate the headset without accessing audio controls. They come with all the adapters needed to connect with a variety of gaming consoles and devices. 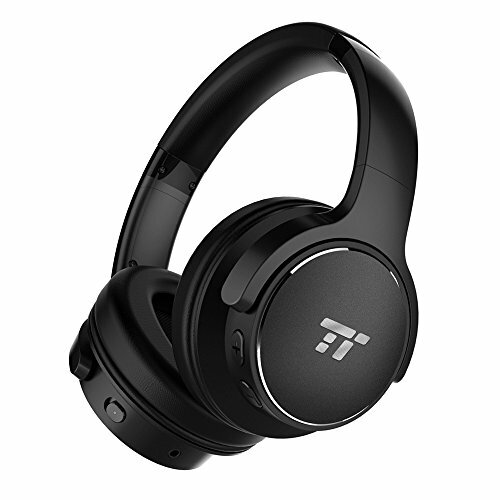 The TaoTronics Active Noise-cancelling Headphones reduce background and environmental noise by up to 25 dB, but also have a quick and convenient in-ear active noise cancellation button that allows you to quickly switch to monitoring mode, so you can hear important sounds and announcements despite the noise cancellation. The noise-cancellation slider also allows you to customize the amount of background noise you want to hear in any given situation, so you can stay connected to the world around you if you choose. They have a built-in microphone with noise cancellation as well, for crisp and clear phone calls. Inline controls switch to calls, adjust volume, and allow you to skip tracks without using your device. They work for up to 15 hours on a single charge, and charge in just 1 hour. They have a durable metal alloy construction and a sleek style. They come with an airline adapter for use when flying, as well as replacement ear hooks, 4 extra ear tips, a charging cable, and a travel pouch. 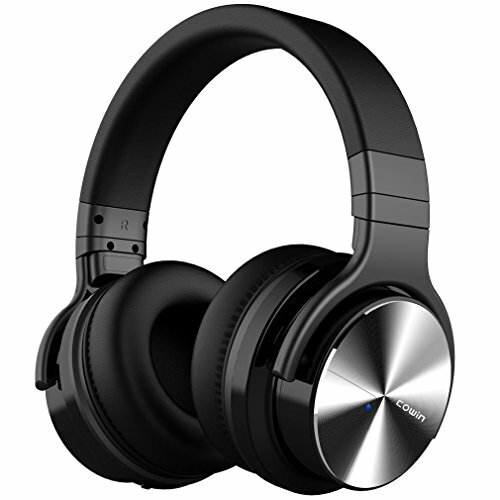 The TaoTronics Active Noise-cancelling Headphones have good noise cancellation of up to 25dB, with a quick monitor button that allows you to hear environmental sounds on demand, without switching off noise cancellation or taking out your earbuds; minimizing the number of times you remove and replace your earbuds helps cable durability and reduces tangling. They also have noise cancellation on the on-cable microphone, as well as quick and convenient on-cable controls. They come with replacement ear tips and ear hooks so you can find your perfect fit, and aluminum construction keeps them lightweight and stylish. 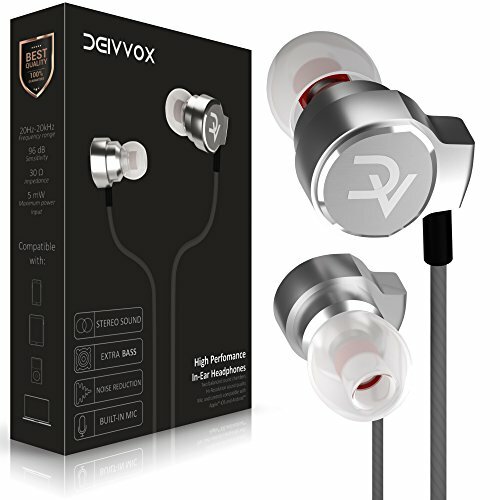 The Deivvox Earphones have high-quality speakers with deep bass and clear treble tones. They have a soft and snug fit that conform to the ear and help to reduce sound leakage. The multi-function control buttons on the cable include controlling the microphone volume for quick adjustments. The sound-isolating design reduces at least 90% of ambient noise. They come with 3 sets of silicone earbud tips of different sizes, and 3 sets of noise cancelling earphone tips, so you can get the right fit for any need. The gold-plated 3.5mm jack protects your audio signal. They also come with a traveling pouch. The Deivvox Earphones have a sleek and stylish look, and convenient multi-purpose on-cable controls for fast and easy adjustments on the fly. They have good sound and light weight, and come with S/M/L silicone and memory foam ear tips, so you can choose the right fit and level of sound isolation for your needs. They also have a traveling pouch, and a gold-plated 3.5mm audio jack. The Villain Bluetooth Workout Wireless Headphones are made for tough workouts. They have loud, clear sound and deep bass to make the most of your music. They have an IPX7 waterproof rating, so they resist sweat, rain, and can safely be used in water activities like surfing or kayaking. The built-in microphone has CVC 6.0 noise-suppression technology for clear voice calls in any conditions. The Bluetooth connectivity keeps your sound stable and untethered to your devices, with low power consumption. The soft silicone over-ear ergonomic hooks keep the earbuds in place no matter what your activity level, and are comfortable and stable for long wear. On-ear controls allow for quick adjustments or taking calls without fumbling for your phone. They charge in 2 hours and last for up to 12 hours on a charge. 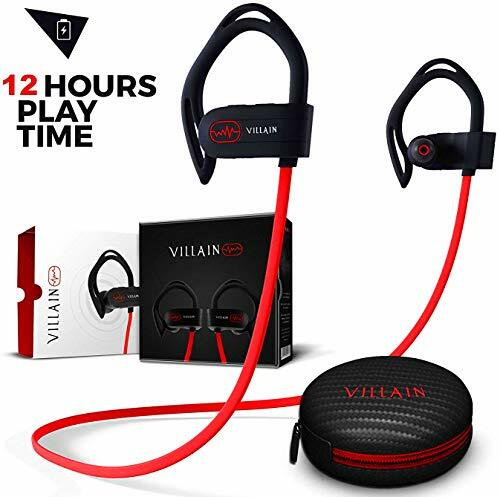 The Villain Bluetooth Workout Wireless Headphones have comfortable silicone ear hooks that keep them in place even during peak activity. They are waterproof, so you can take them into the toughest, sweaty workouts or use them in bad weather without worrying about them. They have noise cancellation for clarity on your calls, and on-ear controls make it fast and easy to make quick adjustments without reaching for your phone. They have a stylish look and a light weight that won't get in the way of workouts, and good sound and rich bass to keep you motivated and active. Noise-cancelling headphones don't have to cost a fortune to give you the private, quiet audio experience you are looking for, so you can concentrate on your media, music, or games without distractions and interference from background sounds. These noise-cancelling headphones are effective, affordable, and have a lot of features to help you enjoy your headphones, whatever your needs may be.